What is the Belvedere Torso? People go to the Vatican Museums in Rome to see amazing things like the ceiling of the Sistine Chapel, the Pietà, and the Laocoön. 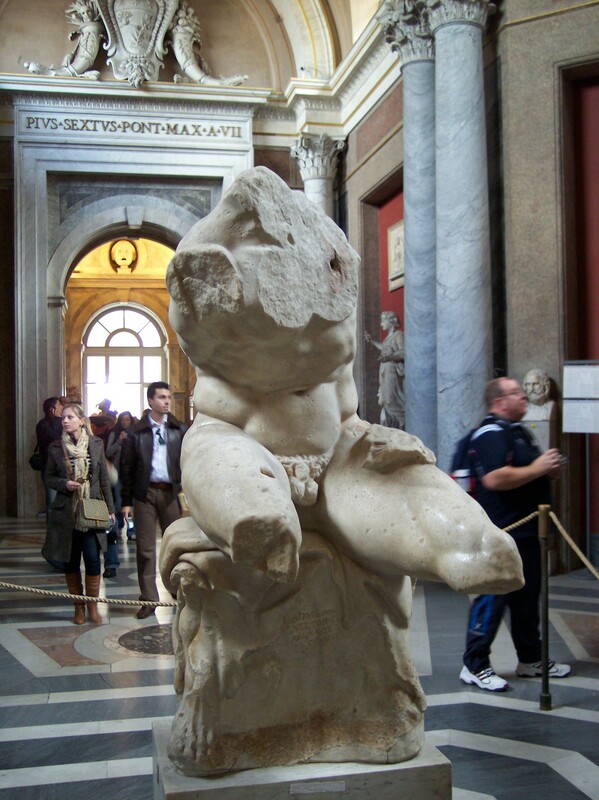 You might walk right by this sculpture fragment known as the Belvedere Torso, but it was known as a favorite of Michelangelo himself. It likely dates to the 2nd century BC and who it depicts is unknown. The powerful musculature, though, was studied and incorporated into other works by many artists over the centuries. It gives me a feeling a bit like time travel to be right there in the same space as this piece of marble that was so inspirational to Michelangelo. Legend has it when the Pope asked him to remake the limbs and head he said, “No, it is too beautiful to alter.” One wonders if this response was truthful in sentiment or a way to wiggle out of an unpleasant job! This was one of my favorite works of art in the Vatican Museum as well! Thanks for sharing and bringing back great memories! I’m glad I could “take” you there today!